One of the very oldest names in the annals of Swiss watchmaking, the Louis Moinet brand, since its revival as an independent in 2003 has been synonymous with high complications and bold design, and it has been a regular finalist in recent years, although sadly, never a winner. Will the Mobilis with its mind-boggling kaleidoscopic motion and double tourbillon see off its rivals in the 2017 GPHG Tourbillon and Escapement category? Let's look closer. One could be forgiven for staring at this watch for minutes on end, and still not be aware of what the actual time is. 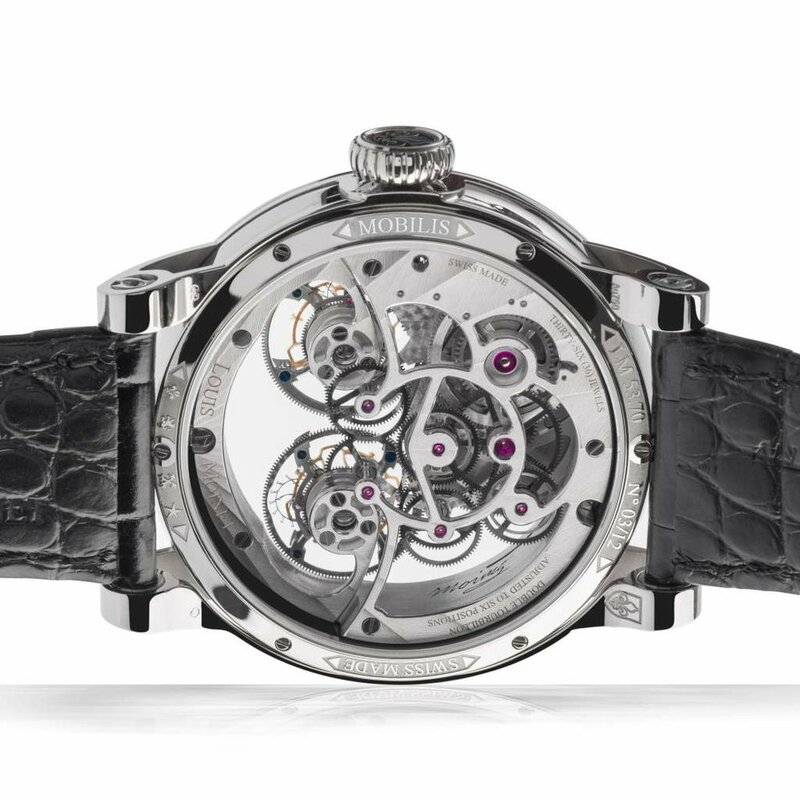 That's not because it is in any way difficult to read, but with the combined visual effect of a pair of tourbillons, rotating against each other, and the strangeness of a dial which draws the eye towards its mesmerising use of a static upper disc above a moving lower element, time could almost be an afterthought. This is not necessarily a bad thing, as the overall effect is one of drama, and the openness of the exposed components, including the way the tourbillon duo appear to be suspended on their ceramic bearing mounts definitely accentuate the fact that this is complicated haute horlogerie of the very highest order. Will the Mobilis' spectacle of intriguing kinetics be enough for Louis Moinet to at last get their hands on the Aiguille award for the Tourbillon and Escapement category? I would not be even slightly surprised or disappointed if it did win, but I don't think it will. There is no question that the Mobilis is an extraordinary feat of watchmaking mastery, and it certainly ticks all the boxes as regards the requirements for this category, but being up against my own favourites, the Bulgari Octo Finissimo Tourbillon Skeleton, and the David Candaux 1740 - The First 8, Louis Moinet may need to try again. Who would be a juror? This is not easy!